I regret that some time has been required for me to determine the situation about your note on an apparatus for sublimation. It has been called to my attention that the work described in this note was done under a classified Government contract, and that accordingly the note can not be published without approval by the OSRD. 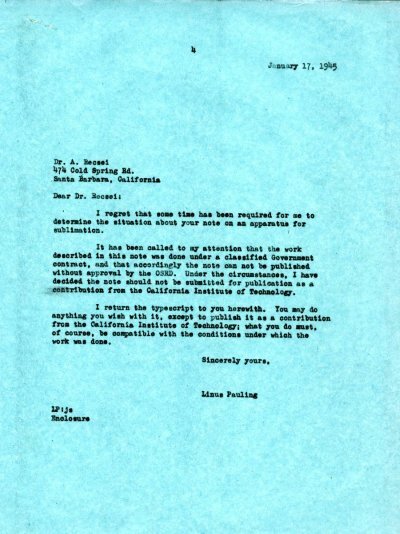 Under the circumstances, I have decided the note should not be submitted for publication as a contribution from the California Institute of Technology. I return the typescript to you herewith. You may do anything you wish with it, except to publish it as a contribution from the California Institute of Technology; what you do must, of course, be compatible with the conditions under which the work was done.